I got a new crockpot for Mother's Day! I'm hoping to return to work soon, so in preparation, I'm getting better acquainted with the slow cooker culture. This chicken was right up our alley, with Chinese-takeout-inspired flavors we love. I served it over white rice and broccoli. Munchkin approved! 1. Season both sides of chicken with lightly with salt and pepper, put into crock pot. 2. Put honey, soy sauce, onion, ketchup, oil, garlic and pepper flakes into a small bowl. Microwave for about 10 seconds to thin the honey and then stir the ingredients together. Pour mixture over chicken. 3. Cook on low for 3-4 hours or on high 1 1/2 – 2 1/2 hours, or just until chicken is cooked through. 4. Remove chicken from crock pot, leave sauce. Dissolve 4 teaspoons of cornstarch in 6 tablespoons of water and pour into crock pot. Stir to combine with sauce. Replace lid and cook sauce on high for ten more minutes or until slightly thickened. 5. Cut chicken into bite size pieces, then return to pot and toss with sauce before serving. 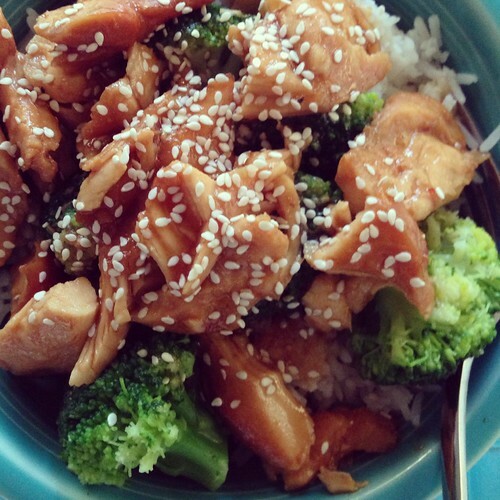 Sprinkle with sesame seeds and serve over rice and steamed broccoli.